Joey Curtis has been selected as the Spring 2019 DAC Member Spotlight. Joey is the son of Richard and Bonnie Curtis of Fairmont. He has one brother, Rick Curtis also of Fairmont. Joey is 39 years old and a 2001 graduate of North Marion High School. He received the Assist Award upon graduation from NMHS for showing great determination and hard work in all of his school endeavors. Joey is a long time member of the Disability Action Center and Special Olympics and in more recent years the PACE Vocational Training Program. 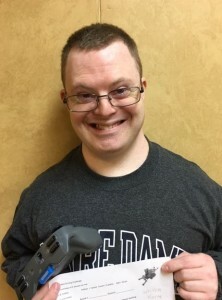 Joey has worked previously as a bus boy at a local restaurant and is currently working as a stall cleaner at On Eagle’s Wings where he also takes riding lessons. He also is a trainee with the RURAL Program with the DAC and Homestead Farm Center where he enjoys learning and experiencing life and work in farm and garden setting. Joey is a very involved young man and highly decorated Special Olympian where he excels in Bowling and Track and Field. In addition to participating in recreational sports, Joey is an avid hunter and a real sportsman. He loves watching sports on television, especially the Pittsburgh Steelers and WVU Mountaineers. He is a constant at all of the Fairmont State Fighting Falcon Basketball games as well! Sports are not the only thing for which Joey has received recognition. Joey has been involved with the local government scene for many years, supporting his favorite candidates and advocating for the rights of working people…like his mom, dad, coal miners, and all West Virginians. Because of Joey’s political work he was chosen as the Marion County Democrat of the year in 2012. Joey excels in everything he does and most recently joined the DAC’s Abilibots team where he builds, programs, and competes on a robotics team. He is also a big fan of Friday Night Outs and fishing trips! Joey is an old fashioned guy whose favorite TV Show is Andy Griffith and favorite movie is JAWS. He loves a good hot dog and vacations to Ocean City, MD. Joey’s favorite musician is Toby Keith and we all know is favorite song…”Whiskey for my men, Beer for my horses”! But most especially Joey loves people. He loves and admires his mom, dad, and brother and close family friend Butch Tennant, with whom Joey has a special bond. Joey wears a smile on his face and his heart on his sleeve. To know him is to love him and he continues to make us proud each and every day!